Spring is in the air! 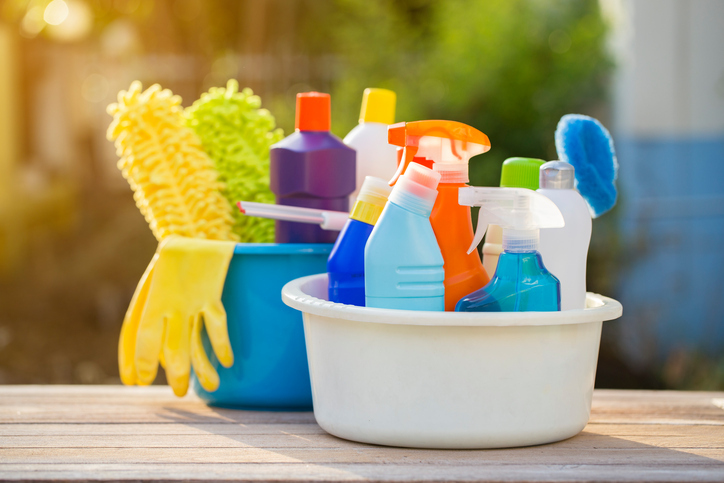 FMCA has gathered a few less-routine RV spring cleaning tips that are easy to overlook when you’re excited to prepare for the season ahead. Insects, especially mud dauber wasps, like to build nests in refrigerator burner tubes, rooftop tank vents, water heater vents, and furnace chimneys. Check and remove any obstructions. Spring is a good time to seal your RV’s exterior with a wax or poly sealant. This will provide a barrier to the elements and protect your rig throughout the year. Consult your RV owner’s manual for recommendations for the particular finish of your RV. Windows, door frames, vents, and any rooftop protrusions (plumbing, air conditioner, satellite, or antennas) should all be cleaned. They also need a good bead of sealant to prevent water intrusion. Check for any cracked caulking, and re-caulk any problem areas. Don’t forget to check your RV storage areas. Odds are that dust and dirt have settled here. Sweep out and, if needed, wash these compartments. Carefully check your RV’s carpet and furniture. Unfortunately, an RV can be a haven for insects, mice, or other rodents during the cold winter months. Mice have been known to chew through carpet or furniture to make their nests. Wash items that you may just spot-clean throughout the year, such as heavy bedding, rugs, pillows, etc. Before you hit the road this spring, now is the time to take care of items that can be difficult to clean while on the road. Clean upholstery and furniture per your RV owner’s manual instructions. Some finishes, such as suede or leather, need special care. Leather can keep its beautiful finish for years if properly maintained. Spring is a good time to vacuum and steam-clean the carpet. This will help prevent odor problems and is another task that is more difficult to complete while you’re in the midst of the RV season. Clean the air filters on the microwave oven and stove hood exhaust. Replace as needed. Speaking of filters…there may also be filters on your water lines for incoming water. Check filters for the sink or ice maker, and clean as needed. Clean the interior of the refrigerator with a good disinfecting cleaner. Leave the doors open to allow for air circulation. Clean the toilet, sink, and shower with a mild cleaner such as lemon juice and baking soda. Try to avoid bleach products, as they can degrade the seals in your holding tanks over time. Check your bathroom cabinets for expired medications and products. Make sure your first aid kit is stocked. The need for odor and moisture control is greatest when an RV is closed up and placed in storage during the off-season. Mold, mildew, and bacteria love to grow in enclosed spaces where the air is not refreshed. Air fresheners help, but they merely mask odors rather than remove them. To remove odors that have a foothold in your RV, consider using an activated charcoal odor removal substance, such as Bad Air Sponge. 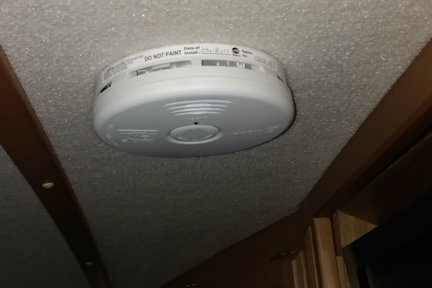 Spring cleaning is the perfect time to check the batteries in your fire detector and carbon monoxide detector. This is a simple and important step to protect your family throughout the year. Hopefully these less common tips provide ideas as you begin your RV’s spring cleaning. Happy travels! 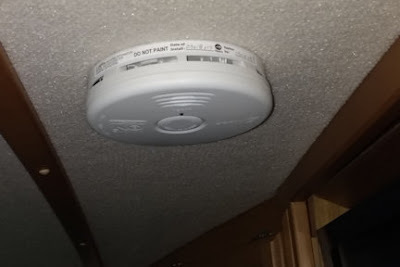 FMCA RV Club brings you this monthly tech tip to Enhance Your RV Lifestyle. FMCA delivers RV know-how to its members. 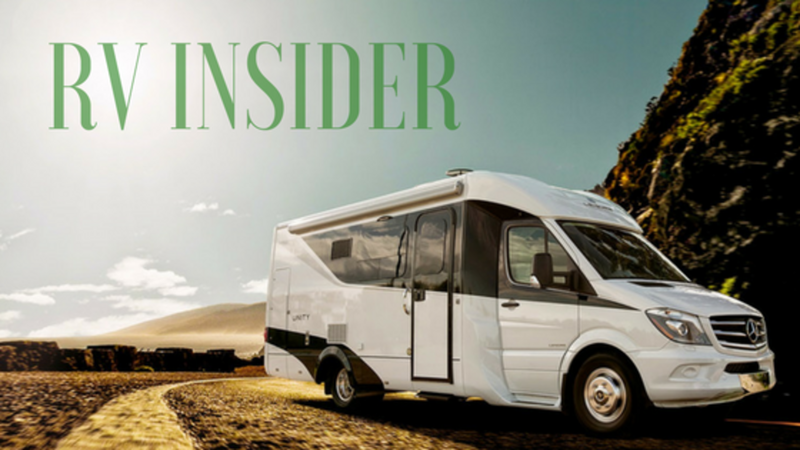 Join today for just $50 — a savings of $10 just for RV Trader readers. Learn more at https://join.fmca.com/trader18. Online research is crucial to many buyers today, and if selling your RV is a top priority for you, posting it on RV Trader is a great place to start to reach those buyers. We have millions of visitors actively looking for their next RV on our site each month - so you’re sure to get plenty of eager eyes on your unit. Wondering how to get the most bang for your buck? 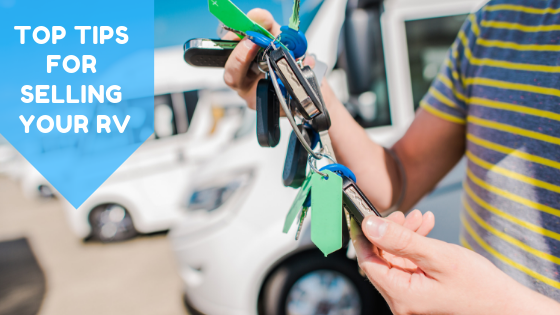 Check out our top tips for making sure your RV Trader listing stands out from the rest. Take High-Quality Photos - Photos have the power to draw buyers in - so make sure yours are the best they can be. Buyers want to see authentic photos when they are searching for listings, so do your best to avoid stock photography. We suggest including a wide variety of photos on your listing of both the inside and outside of the RV. Take your listing photos in natural daylight so they are not washed out and make sure to use a camera that takes top-notch photos buyers want to click on. Clean Your Unit Thoroughly - Make sure the RV you're selling is spotless, both inside and out. 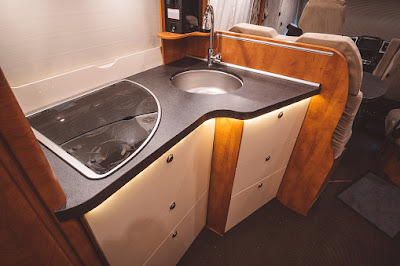 Buyers want to see their potential RV in tip-top condition, so you should give the unit a detailed wash and declutter the interior before you take photos or invite potential buyers over to tour/test drive the unit. Be Honest About Your Unit - You’ll want to photograph and describe any and all damage the RV has right off the bat. It’s important to be open and honest with buyers so you don’t lose credibility and, potentially, the sale. Buyers appreciate honesty - so keep that in mind when creating your listing. Include a Price- Including a price in your listing is crucial. Buyers want to know this information up front to determine if your unit fits into their budget - and we can all relate to that! It’s been proven that units listed with a price get 8X more clicks and 3X more connections on RV Trader than listings that don’t. This simple addition can make a big difference. Put Yourself in the Buyer’s Shoes - When crafting a listing, or even giving a tour of your RV, it’s important to put yourself in the buyer’s shoes - which should be easy since you were once a buyer. Ask yourself, “what did I want to know before purchasing my RV?” or “what advice/knowledge can I share since I’ve been through the process before?” Providing this type of information is extremely helpful for potential buyers - especially if they are new or just getting into the RV lifestyle. Write a Detailed Listing Description - While descriptions can be tedious to write - they are so important, particularly for the first time buyer. Buyers need your help deciphering how this particular RV is going to fit into their lifestyle - and you have the opportunity to be the expert. We recommend highlighting all the key features of your unit, how many it sleeps, it’s length, and how you’ve used the unit previously. The more details, the better! Respond to Potential Buyers in a Timely Fashion - We live in a world where instant gratification is the norm, so you’ll want to keep that in mind when RV inquiries come rolling in. We encourage you to check your messages regularly so you can respond to an interested buyer quickly after being contacted. Buyers can move fast so they will likely move along to another listing if you don’t respond in a timely fashion. Include Relevant Keywords- Make sure to include keywords that are relevant to your specific unit - that way as people are searching online, your unit pops up easily. For example, the word “towable” is a top search word. We hope that these 8 tips have helped you realize that selling your RV doesn’t have to be difficult. If you follow these tips, you’ll have an even higher chance of getting more eyes on your listing! If you’re interested in selling your RV on RV Trader, click here. Long gone are the days of small businesses sticking to brick and mortar storefronts. Many creative entrepreneurs have decided to take their businesses out on the road… in their RVs! We’ve compiled a list of a few genius businesses that are all fully functioning out of campers, trailers, and motorhomes. These businesses will delight, surprise, and might even inspire you. 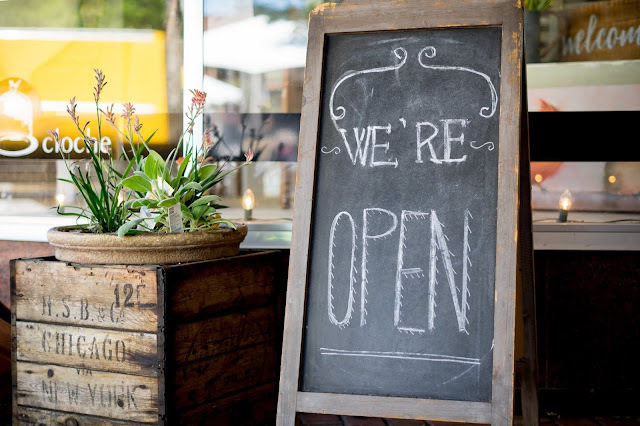 Check out a few of our favorite mobile businesses below. Brick and mortar boutiques will become a thing of the past with designers like J.D. Luxe Fashion going mobile. Their flagship “truck and mortar” store opened its doors in 2011 in beautiful Woodland Hills, CA to offer customers a one-of-a-kind shopping experience. Now you don’t need to visit the closest shopping mall to find the hottest trends in fashion. 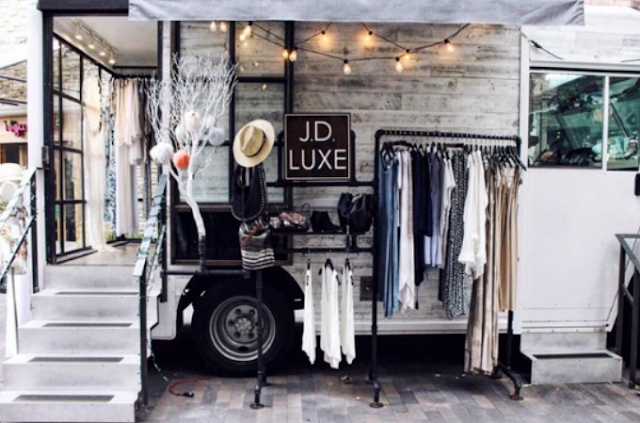 This mobile boutique offers California locals a unique (and chic) shopping experience on wheels. While they do run storefront locations, J.D. Luxe swept up media attention on the streets of Los Angeles and at festivals like Coachella. Their eye for design, the mobility of their store, and online shop makes J.D. Luxe Fashion a competition for standalone fashion entrepreneurs everywhere! It seems we’d be amiss if we didn’t include a business having something to do with animals in our RV businesses piece, and we didn’t have to look far - It’s a Dogs Life Spaw made us fall in love with their mission of providing a traveling, tail-wagging worthy grooming experience for West Coast pups! Kristi, creator of the “Spaw,” has loved animals as long as she can remember. No matter what the situation, every time she saw a stray dog, she brought it home with her. Over the course of her lifetime, she’s owned and raised a number of other pets, including horses, and exotic species. The Spaw itself is state-of-the-art, and comes fully equipped with warm water, climate-controlled mani areas, and top-of-line amenities with zero cages or crates. It’s designed to provide not only a bathing experience, but a relaxation, stress-relieving (“Spaw”) experience for the animals, too - so the open, comfortable environment makes for just that. 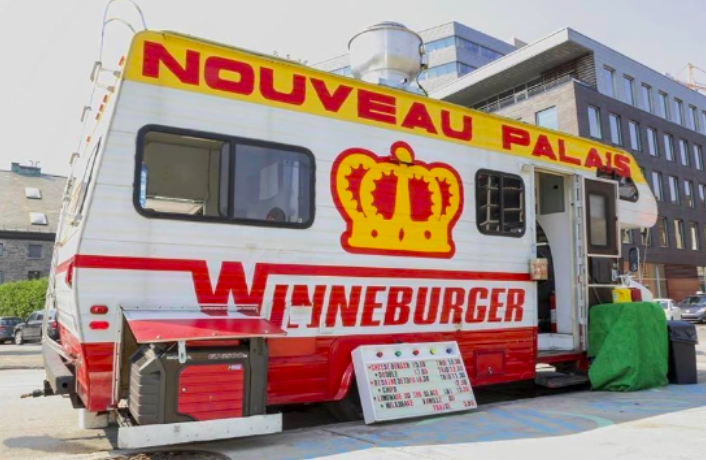 What do you get when you mix burgers with classic Winnebago vibes? Winneburger, of course. 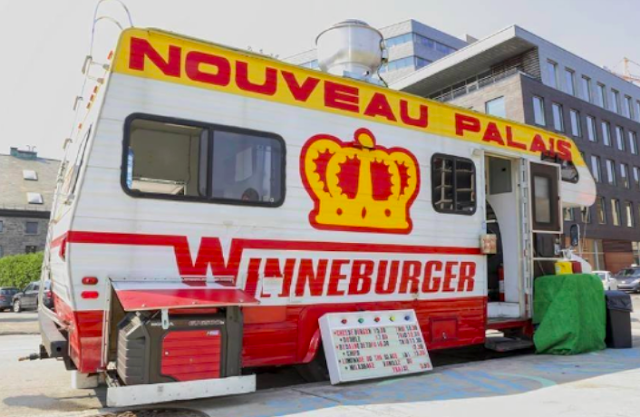 Based out of Montreal, the Winneburger is a fully-equipped traveling kitchen, operated by the popular local restaurant Nouveau Palais. Functioning out of a 1980s revamped Winnebago, it is designed to blend vintage vibes and decor with modern, freshly produced grub. Always including a veggie-friendly option with their meals, their goal is to provide all customers with a memorable, unique cuisine experience. Owners Gita Seaton, Mary Martha Campbell, and Jacques Seguin are the seasoned chefs and restaurant business experts behind the small business and noted a few go-to items on the Winneburger’s menu, including kettle chips, homemade lemonade and iced tea, and ‘old-fashioned’ milkshakes. Their famed, sweet challah buns make their burgers famous, and nothing compares to these key dishes, such as the Mushroom Burger (imagine a breaded, fried Portabello cap- stuffed to the brim with cheese, then placed on a challah bun) with all the fixings. In need of a photographer for your event? Why not mix it up and rent out the Airstream Photo Booth curated by creative entrepreneurs Yvonne and Chris Johnson? 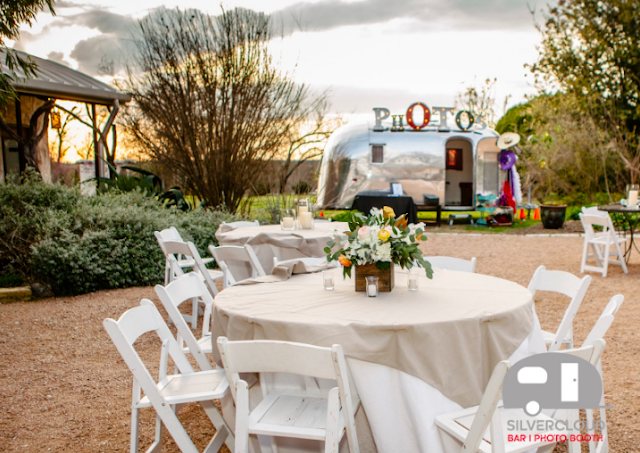 Based out of the Austin, TX area, Yvonne and Chris are both experienced in the wedding photography industry, and noticed a popular trend developing in the industry: rentable photo booths. Hoping to offer an individualized spin on this trend, they aligned this interest with Texas’ popular affinity for Airstreams. Switching up the traditional backdrop of large events, regardless of whether it be a wedding or festival, the Airstream Photo Booth experience comes fully equipped with fun, engaging props for dress-up, and the company offers both a full-size Airstream and smaller sized ‘Bambi’ trailer for smaller-scale events. Tattoo culture is often a male-dominated space, but Shanzey Afzal had a plan to create change. Shanzey is a 26-year-old tattoo artist who converted a 1963 Shasta trailer into a mobile tattoo studio called Ink Minx. 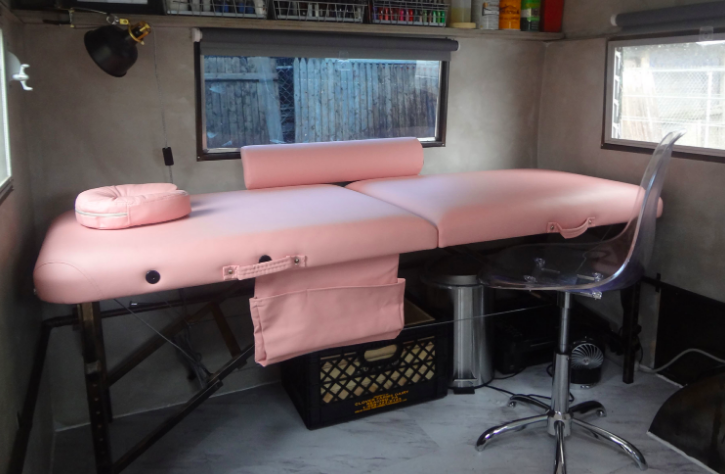 The mobile tattoo studio isn’t your average parlor, it caters to a specific audience - women. Shanzey was inspired at a young age by henna tattooing, which is a tradition from her Pakistani culture. The inspiration turned into something more and she began a tattoo apprenticeship at age 21, becoming a licensed artist soon after. As she observed the tattoo industry during her apprenticeship, she came to find that it wasn't always an inclusive place for women so she made it her mission to create an inclusive and safe space for women to express their creativity and participate in tattoo culture. Ink Minx might be located in a small trailer, but it is packed with a lot of heart. The trailer includes just the tattoo basics like one tattoo table, a counter station, fold-out desks, and a few other odds and ends required to get the job done. The pink interior gives off a feminine and welcoming vibe to anyone about to make a tattoo commitment. One of the main reasons Ink Minx is a mobile unit is that Shanzey’s mission is to empower women across the country. Shanzey has recently traveled up and down the East Coast to tattoo women and plans on adding additional stops (including music festivals) in the near future. Brendan Barry attended art school in England, but found out pretty early on that he quite frankly “wasn’t very good at art”. He began getting into photography and years later received his master's degree and later started teaching the subject. Barry has built a variety of handmade cameras in the past but started thinking outside of the box - or should we say camera. He was inspired to make a camera where people would be physically invited into the process of photography. That’s when the Caravan Camera was born. The Caravan Camera is an RV converted into a working camera obscura. From buying the unit to having it fully completed took roughly 2-3 weeks. 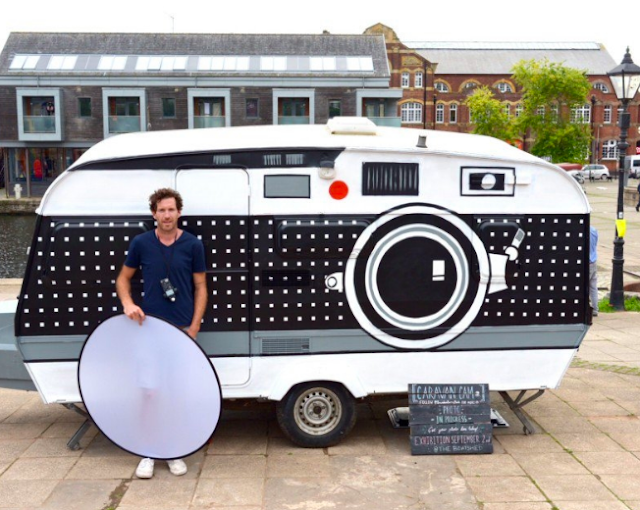 Individuals can stand outside of the RV to get their photograph taken by the caravan. The inside of the camera also hosts a darkroom where the film is then developed. Barry has grand plans for the Caravan Camera, including taking it to schools, hospitals, and community groups to excite and engage people in the process of photography. He plans on building a bigger camera in the future that will be wheelchair accessible so a variety of people can appreciate the art of photography. Andrea Denniston is a studio potter based in Virginia who decided to get creative with her art show display. She entered the craft show world and wanted to find a way to make the most of her allotted booth space, that’s when she began researching trailers. During the summer of 2015, she designed a chassis and commissioned outside assistance to make her dream mobile display come to life. Her mobile gallery is a 4x6 foot teardrop trailer that is cute as a button, yet still very practical for her needs. Denniston loves pottery and that love shines through each of her creations. Her goal is to make pottery that will find its way into someones home and works to create unique and engaging objects. She enjoys working with a bright color palette and her mobile gallery highlights her work in a way that’s incredibly pleasing to the eye. 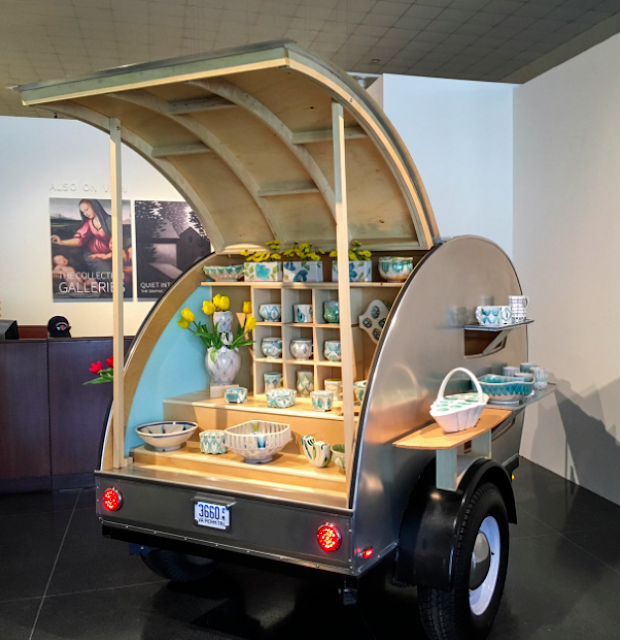 The display has a hatchback style opening on the back of the trailer complete with a variety of shelves to securely hold and protect her stunning porcelain creations. Due to its small size, the trailer can be easily towed to various craft shows where Denniston displays her work. There is not a lot of interior room to spare, but when fully set up, the trailer even has space for a packaging station. Denniston's husband Seth, who is also a potter, occasionally uses the trailer to display his gas reduction stoneware. He runs a business called Poor Farm Pottery. These are just a few stories of courageous entrepreneurs that have made it big with their RV businesses. So many small business owners are now operating “storefronts” out of their campers and motorhomes - we’re excited to see what they come up with next! What are some other small businesses you know of that are operated out of RVs or trailers? Would you ever consider developing a small business startup in your own camper? Let us know in the comments below! If you’re anything like us, we can’t imagine leaving home for our next adventure without our dogs. Our four-legged friends are considered part of the family and we often ask ourselves, “what did we do to deserve dogs?” With SO many RVers out there, we know we aren’t alone. 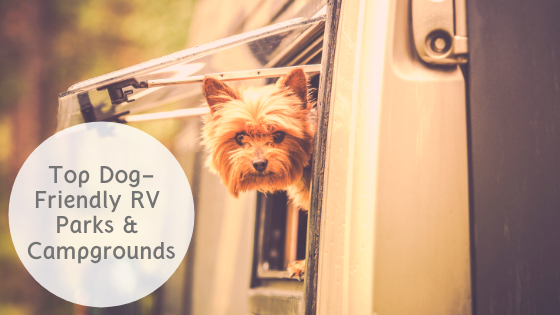 So to make sure you never have to leave home without little Fido in tow, we’ve compiled our list of top dog-friendly RV parks and campgrounds that will be sure to be a tail-wagging good time for both you and your pet! Four Paws Kingdom - Four Paws Kingdom is located in Rutherfordton, NC and as its name suggests, is truly a kingdom for dogs. This campground is in the foothills of the Blue Ridge Mountains and is the first and only campground in the U.S. dedicated to dogs. Four Paws Kingdom includes a fenced in swimming pond, multiple dog parks, trails, a dog bathhouse, and even a grooming salon! There are also tons of benefits for you dog owners out there like RV hook up sites, WiFi, cable TV, and so much more. Normandy Farms - Normandy Farms is located in Foxboro, MA and is a luxurious campground located deep in the woods between Boston and Cape Cod. This resort takes dog-friendliness to the next level by providing a 1.5-acre dog park, agility equipment, a dog washing station, dog walking services, and they even provide kennels services for your furry friends. They do have a few pet specific restrictions, but overall this campground is extremely dog-friendly if you meet those requirements. Normandy Farms is stunning and hosts a variety of activities for guests. The grounds and facilities are top-notch and have plenty of room for RVs of all sizes. Lake George RV Park - Lake George RV Park is located in Lake George, NY and is thrilled to welcome pets on their grounds. The park includes a 2-acre off-leash dog park for dogs to run freely and get out any pent up energy after long days of travel. The “Bark Park” also includes a pet vending machine stocked with toys and treats - this is what doggie dreams are made of. Wait there’s more! The park also includes a dog splash pad to cool off on hot days and agility/turf areas for play. Dogs are also allowed in the indoor areas of the park including their main lodge, general store, and cafe. You won’t have to leave your dog anywhere when you visit this RV park! Garden of the Gods RV Resort - Garden of the Gods RV Resort is located in Colorado Springs, CO and is truly camping at its best. You’ll have to pick your jaw off of the floor when you take in the surrounding views. But how does this park cater to your pups? Glad you asked. Garden of the Gods RV Resort is a pet-friendly park that includes an off-leash Bark Park for your dogs to run wild in. They’ll be able to interact with other dogs and get out all of their energy. This resort has plenty of RV campsites and offers standard, deluxe, and premium sites for RVers. This resort sounds like a win-win for both you and your pet. KOA Kampgrounds - There are hundreds of KOA Kampgrounds across the country and they are all pet-friendly! KOAs have special Kamp K9 areas of their grounds where dogs can roam around off-leash and they often include washing stations. Many KOAs also have dedicated areas for large and small dogs so your dog can play safely. There you have it! Our list of top pet-friendly RV parks and campgrounds. With these options, you’ll never have to leave your precious pooch at home. Bring Fido is another great resource to check out so you can see nearby pet-friendly locations. For more tips on traveling with pets, click here. 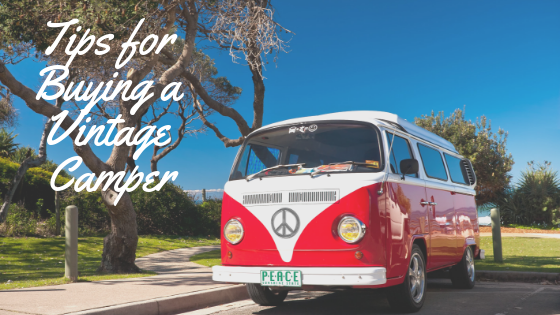 Vintage campers have the ability to transport us back in time, have an undeniable charm, and are all the rage right now - which is why so many consumers are interested in purchasing them. But the real question is - is a retro trailer the right choice for you? Before you claim a little piece of history, there are a few things to consider when buying vintage. We’ll share a few questions to ask yourself and simple tips you need to know before buying that diamond in the rough. Determine usage level - Before you buy, it’s important to ask yourself how you’ll be using your vintage camper. Are you planning on taking short weekend getaways or cross country road trips? You’ll want to determine what you’ll be using your camper for so you can decide on proper size, quality, and length to best fit your RVing needs. If you’re planning on parking your unit at specific campgrounds or RV parks, you’ll need to see if they have any restrictions on vintage units. Gauge your budget - It’s time to empty out the piggy bank to see what finances you are working with before buying a vintage camper. If you are buying a full restored camper, you might be looking at a higher price up front but this could minimize future repairs in the long run. On the other hand, buying an older model can definitely be a more cost-effective option. But if you plan on renovating your camper, you’ll need to be prepared for any surprises that come up in the process. To DIY or to not DIY? This is an important question to ask yourself before you consider buying a vintage RV. There are many vintage RVs on the market that have already been completely renovated and restored, so if you’re looking eliminate the DIY work, those units might be your best option. If you’re toying with the idea of buying a true vintage camper, you'll want to assess your ability level and the time, money, and energy you want to spend on fixing up an older model. Renovations give you the ability to give your camper a custom feel, but it’s important to keep in mind that they also take time and effort to restore. Check for any electrical damage - Electrical damage can be a dealbreaker when it comes to buying a vintage camper because to get to the root of the electrical issue, you will typically need to remove all of the interior walls. Unless you’re extremely handy, you will most likely have to bring in a professional. That’s why it is a good rule of thumb to make sure all the electrical systems are in good working order before making your purchase. It’s also a good idea to double check that the propane systems are working properly as well. Fully examine the exterior of the unit - Before purchasing a vintage unit, you’ll want to take a look around the exterior of the unit to make sure it is in good shape. Check the panels and glass to make sure there are no cracks. A few dents might not be a dealbreaker, but if the exterior of the camper is in bad shape that means there is a higher chance of leaks down the road. Know your towing capacity - It might sound obvious, but if you’re planning on buying a towable vintage unit, you need to make sure you have a vehicle that can actually tow your trailer. Vintage campers come in a variety of sizes, lengths, and weights, so you’ll need to keep that in mind when starting your search. You will also need to find out the towing capacity required and the weight of the specific unit you’re interested in to make sure it’s a fit for your current vehicle. Make sure to keep our tips in mind if you’re on the hunt for a “seasoned” model. Vintage campers can be so much fun to own and the renovation process can be exciting, but it’s important to know everything that comes along with purchasing a vintage trailer. If you’re looking for a retro beauty of your own, check out our listings on RV Trader!